Pseudo-obstruction, also known as Oglivie’s syndrome in the acute setting, is a disorder characterised by dilatation of the colon due to an adynamic bowel, in the absence of mechanical obstruction. The disorder most commonly affects the caecum and ascending colon, however can affect the whole bowel. It is a rare condition, yet is most common in the elderly. In this article, we shall look at the causes, key clinical features, investigations and management of acute colonic pseudo-obstruction. The exact mechanism is unknown, yet it is thought to be due to an interruption of the autonomic nervous supply to the colon resulting in the absence of smooth muscle action in the bowel wall. As with mechanical obstruction, untreated cases can result in an increasing colonic diameter, leading to an increased risk of toxic megacolon, bowel ischaemia and perforation. *Focal tenderness indicates ischaemia and is a key warning sign. Patients with bowel obstruction may be uncomfortable on palpation due to the discomfort from pressing on a distended abdomen, but there should be no focal tenderness, guarding, or rebound tenderness unless ischaemia is developing. Plain abdominal films (AXR) will show bowel distension, however this will be much the same as mechanical obstruction hence has limited use in definitive diagnosis of the condition. 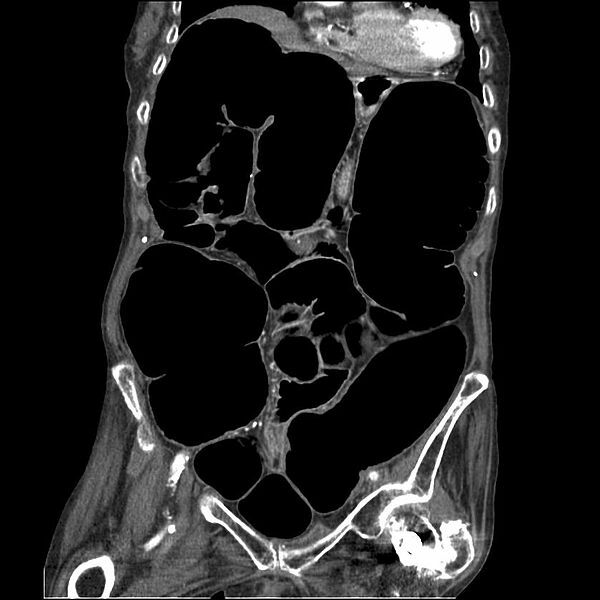 Patients presenting with features of pseudo-obstruction should undergo an abdominal-pelvis CT scan with IV contrast. This will show dilatation of the colon, as well as definitively excluding a mechanical obstruction and assessing for any complications (e.g. perforation). Motility studies will often be required in the long-term and potential biopsy of the colon at colonoscopy. Most cases can be managed conservatively and do not require surgical intervention. Treatment of the underlying acute illness will be required. Patients should be made NBM and started on IV fluids, with a fluid balance chart started; if the patient is vomiting, an NG tube should be inserted to aid decompression*. Any underlying cause should be identified and managed accordingly. Ensure appropriate analgesics and prokinetic anti-emetics are also prescribed. In most cases of pseudo-obstruction that do not resolve within 24hours, endoscopic decompression will be the mainstay of treatment. This involves the insertion of a flatus tube and allowing the region to decompress. Nutritional support should be considered in these patients, particularly if recurrent, as this may lead to weight loss and malnutrition. Regular small soft or liquid meals may be easier to digest. In cases with suspected ischaemia or perforation, or those not responding to conservative management, surgery may be indicated. In the absence of perforation, segmental resection +/- anastomosis will often be performed, however unless a unless affected areas are removed this will not be curative. Alternative procedures can be done to decompress the bowel in the long-term, such as caecostomy or ileostomy. Which of the following drug classes is not associated with pseudo-obstruction? What investigation option is not routinely indicated for a patient with suspected pseudo-obstruction? What is the best initial management for a patient with clinically and radiographically confirmed pseudo-obstruction, who is otherwise clinically stable?